One of several ranges from this upmarket speaker brand, the 'plain-Jane' DM-series loudspeakers are primarily intended to combine Dynaudio's core technologies within cost-effective suits of clothes. The DM3/7 is certainly no exception, being a straight two-way that combines two 170mm bass/mid drivers operating in parallel and a 28mm doped fabric dome tweeter inside a decidedly plain and understated enclosure. But while the DM3/7 won't stand out in any fashion parade, it does look neat enough in its own understated way and also incorporates much of the fundamental engineering content found in the company's more costly models. The DM3/7 is actually the latest of a DM-series that currently comprises three stereo pairs and a centre-front AV model. It's also the first floorstander and, in some respects, it's rather similar to the less costly DM2/10 standmount that we reviewed. It might be a very different shape and have two bass/mid drivers instead of one, but the total diaphragm area is actually quite similar. Indeed, given that the DM2/10 recently disappeared from the website product listings, it seems very probable that the DM3/7 is actually seen as the replacement for that large standmount. In fact, its two 115mm diaphragms are about 10 per cent larger than the DM2/10's solitary 155mm diaphragm. The enclosure volume is also slightly larger (by about 20 per cent) and the port is tuned to a rather lower frequency. This does give it several advantages: its smaller drivers, for example, will deliver wider dispersion and better crossover integration and its unusually large diameter (75mm) voice coils will also considerably increase the already prodigious power handling. A single pair of terminals accept 4mm plugs or bare wires, but not (easily) spades. Bungs are supplied for blocking the ports if preferred. Designed to be wide enough to accommodate the 170mm main drivers, the enclosure's extra-thick front panel is matt charcoal, with slightly chamfered vertical edges (a full-height, black fabric grille is also available). The other four visible faces are finished in either black or rosewood wood-effect laminate. A little MDF plinth provides solid fixing for the substantial 8mm spikes, but doesn't increase the stability footprint at all. Indeed, this is actually slightly smaller than the enclosure itself, which not only seems something of a wasted opportunity, but looks unlikely to pass the EC's 'tilt test' – though it's by no means alone in doing so. Technical specifications and aesthetics aside, when viewed in the overall context of today's hi-fi marketplace, the price might still seem a bit on the steep side for a laminate-finish floorstander, but that has much to do with the country of manufacture (in this case Denmark) and the dramatic effect that Chinese production has had on driving down prices elsewhere. What's more, Dynaudio pays little attention to the fashion trends that seem to drive the loudspeaker scene, and even though its various ranges tend to look sober and restrained, it is still one of very few manufacturers to sell its products into both the domestic and pro audio sectors. The DM3/7 is innately very well balanced overall, albeit notably full through the bass region in normal (i.e. ports left open) mode and with the speakers well clear of walls. This seems to be the best all-round compromise: using the bungs to block the ports might prove helpful, especially if the speakers have to be placed close to a wall. However, close-to-wall siting tends to boost the 50-100Hz octave, while the ports here deliver maximum output down at around 30Hz. Although the bass is strong, experience has shown that bass quality matters much more than relative quantity and the bottom end is undoubtedly one of this speaker's strengths. 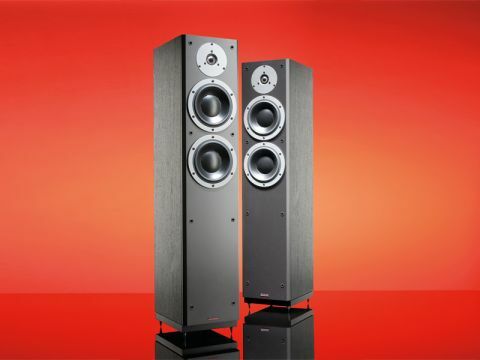 Furthermore, by tuning the ports to a very low sub-30Hz, they avoid being excited by programme material – a problem that particularly afflicted the far smaller Contour S 1.4 and, to a much lesser extent, the DM2/10. So the bass here is full, very extended and free from boom or thickening. It drives along pretty well, with good weight and scale plus some authority and while it might not match the grip or tension of larger and more costly designs, its delivery is certainly as good or better than others in its price class. The sound quality is impressive at the top end of the band, too. The treble sounds sweet and clear and its relative level is beautifully judged, while the vital transition through the voice band from the midrange to the treble is equally well handled, avoiding any aggression yet also sounding reasonably open and very coherent. Stereo imaging is good too, at least in terms of its central focus. Certainly no boxiness is apparent here, but midband transparency seems somewhat limited, so image depth is a little restricted. While the DM3/7 performs very well at both ends of the audio band, its midband isn't as impressive. Voices have slightly pinched and nasal coloration – this is not severe enough to be irritating, but it is audible in comparison with more costly references. There also seems to be a mild loss of dynamic expression here, with the net result that the overall sound somehow lacks some get-up-and-go. It's all quite smooth and inoffensive, with generally good neutrality and overall balance, but it's not a particularly exciting experience, especially when operating at very low volumes. While sound quality is clearly the most important part of any loudspeaker, it's by no means the only relevant factor in the overall mix of engineering compromises that make up any design. For example, the uniquely large (75mm in diameter) voice coils used in Dynaudio's bass/mid drivers have several important implications. Because they're large, cooling is relatively efficient and power handling is, therefore, prodigious. As a result, however, and despite using low-density aluminium wire, the weight penalty means that the midband sensitivity is quite modest. And although the load is less demanding than some Dynaudio models, it's still quite forceful. There is much to like about the DM3/7. It looks rather attractive in the company's typically discreet style, though a larger plinth would improve both the appearance and the overall stability. The overall balance is exceptionally well judged – significantly better than the DM2/10, in fact – while the bass alignment proved particularly effective, giving fine extension without any significant unwanted emphasis on performance. While both the bottom and top ends of the audio band are very well handled by this speaker, the midband was rather less impressive, so the end result remains a little understated in complete contrast to its DM2/10 predecessor.